YLF is June 16 – 21, 2019 on the Edgewood College campus in Madison, WI. Or, email your completed application to jennifer.neugart@wisconsin.gov as a Microsoft Word or PDF file. Interested in working at the YLF? If you’d like to spend a week working with some awesome and eager young adults, complete the application below and return it to Jennifer Neugart at the contact info above. 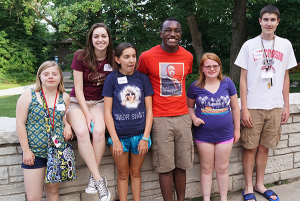 The YLF needs Small Group Facilitators, Counselors and Peer Mentors. Please review the following job descriptions to determine which role(s) you are interested in and qualified for. YLF staff are typically young adults who have been through the program when they were in high school or who have personal experiences with disability and going to work, school, college, advocating for oneself, etc.